During the 1950s and 1960s, the couturiers Christian Dior, Hubert de Givenchy, Yves Saint Laurent and Cristóbal Balenciaga all worked together with the Swiss firm, Abraham, for their exclusive fabrics. This company was specialized in printing silks. 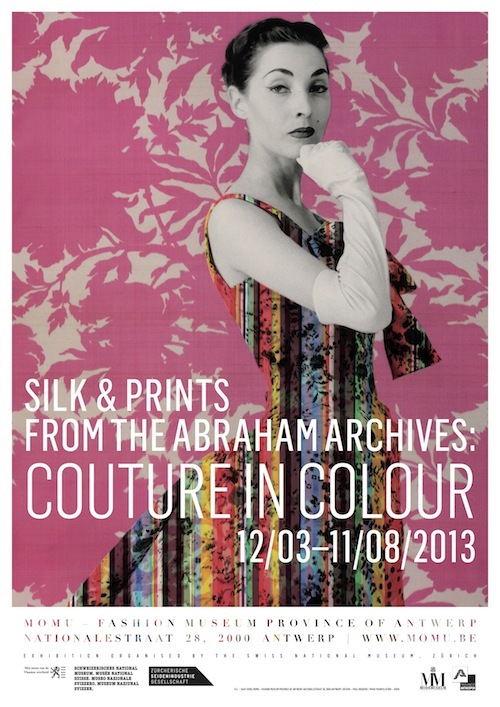 Today, the Abraham archives, an impressive collection of sample books, couture photographs and textiles, are housed at the Swiss National Museum in Zurich. MoMu Antwerp recaptures and expands on the exhibition, Soie Pirate: The Abraham Textile Archive Zurich, held from 22/10/2010 – 20/02/2011, at the Swiss National Museum in Zurich.Silks & prints from the Abraham archives - Couture in Colour, tells both the story of the Abraham company and that of European couture, art and luxury throughout the 20th century. MoMu complements the original exhibition and completes it with couture silhouettes by Dior, Givenchy, Yves Saint Laurent and Balenciaga. The exhibition, Silks & prints from Abraham - Couture in Colour, reveals which colourful textile prints were created by the Abraham firm. Contemporary designers, including Dries Van Noten, Diane Von Furstenberg and Peter Pilotto, were invited to experiment with Abraham prints. The exhibition will take place from 13th March until 11th August, 2013 at MoMu Fashion Museum Antwerp, Nationalestraat 28, Antwerp.